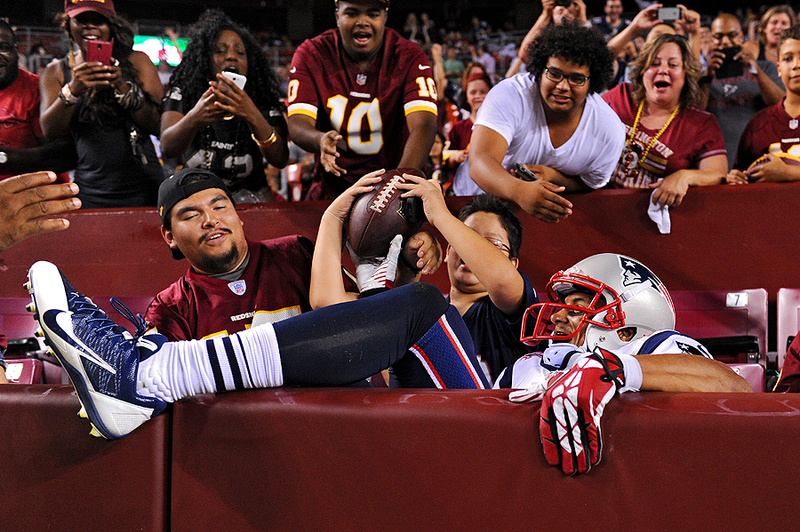 "Fans try to grab the ball from wide receiver Brian Tyms #84 of the New England Patriots after he scored a touchdown in the fourth quarter against the Washington Redskins during a preseason NFL game at FedExField on August 7, 2014 in Landover, Maryland." It's Fall and time for football. Although baseball is still in full swing, and in Baltimore, the Orioles are thriving, it feels as if everyone is ready for some pigskin action. Typically preseason is about photographing as many players as one can, and that can be challenging, when some players only are on the field for a play or two. It was an exciting game for preseason, and just when the game was about to end, Brian Tyms of the New England Patriots caught a ball right in full stride and couldn't hit the brakes hard enough before going into the stands. Usually, leaping into the stands is done on purpose after scoring to bond with fans, but this time, the player ended up in the oppositions hands after failing to stop. 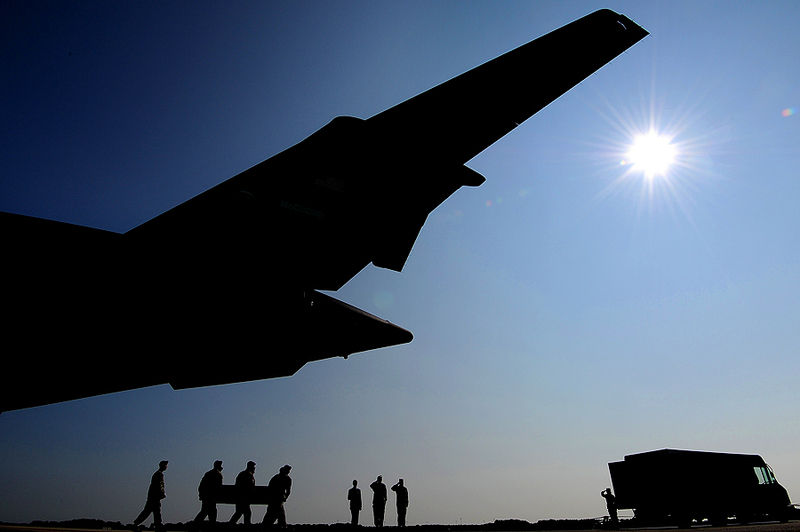 "U.S. Army soldiers carry the flag-draped transfer case containing the remains of U.S. Army Maj. Gen. Harold J. Greene during a dignified transfer at Dover Air Force Base on August 7, 2014 in Dover, Delaware." Covering a dignified transfer is never easy and these type of stories always need to be told. I approached this dignified transfer the same way I always cover them - with respect for our fallen and wanting to grab the attention of the viewer. 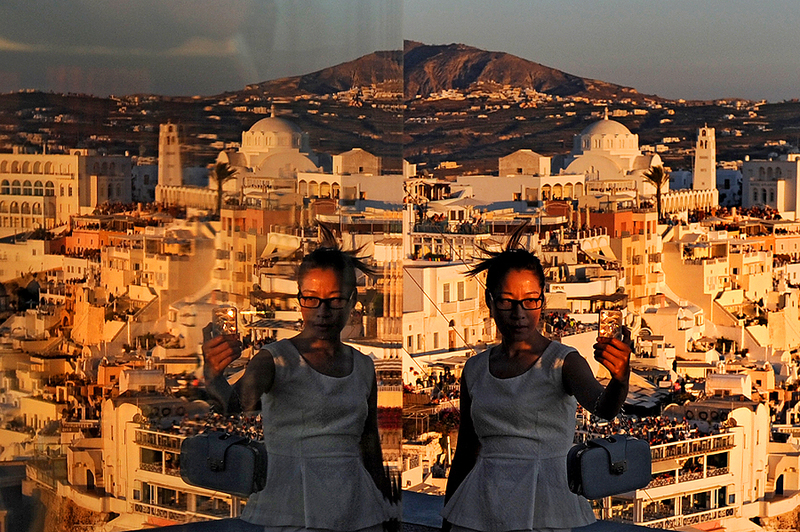 This time I wanted to change my viewpoint and I decided to silhouette my wider camera, which was a remote camera on the ground, for a graphic picture that no one else was photographing that day. In the end, it was eye-catching during a solemn moment in our world - and if that makes someone stop and pause for a second more, so that understand what is happening in our world, than I've done my job. 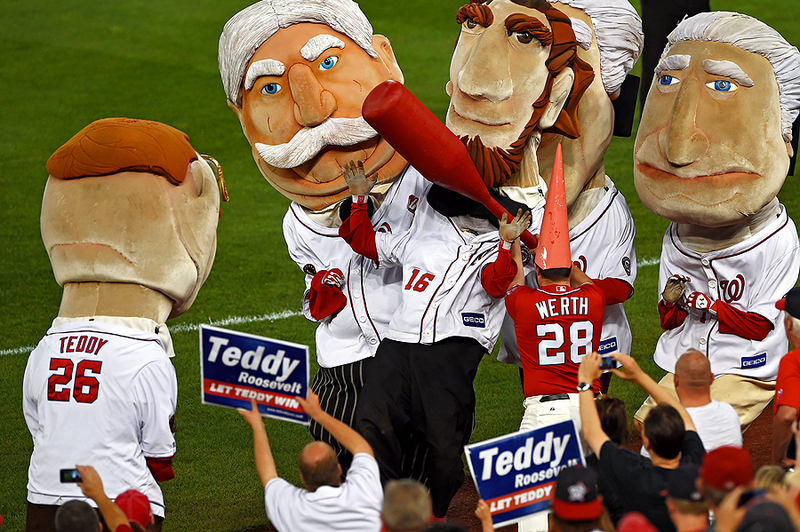 "Dressed as the gnome giveaway of Jayson Werth #28 of the Washington Nationals, a staff member hits Abraham Lincoln with a bat during the President's Race entertainment show at Nationals Park on August 5, 2014 in Washington, DC." It's easy to ignore the entertainment interludes of sporting events - whether it's cheerleaders, dancers, signers, or productions - most eyes are on the players and their heroic performances. But these performance acts are just as important as the game being played, and I always make a picture of each to make sure I have my bases covered pending they're a celebrity or simply want to have some fun with it. Between inning entertainment at Washington Nationals games is always the President's Race. Employees dressed as former Presidents, living and dead, race to the finish line from the outfield wall. How they keep it fresh is beyond my creative skill set, but it's quite comical. I tend to be transmitting pictures during this nightly race, but when I'm not, I'm documenting the sport within a sport hoping for something off the wall. This night, dressed as the gnome giveaway of Jayson Werth of the Washington Nationals, a staff member smacked Abraham Lincoln in the face with a bat during the President's Race. Enough to evoke an emotion from myself, maybe because I witnessed it first hand, I thought it was one of the better images from the race I've documented and wanted to share. "Kei Nishikori of Japan returns a shot to Sam Querrey of the United States during Day 3 of the Citi Open at the William H.G. FitzGerald Tennis Center on July 30, 2014 in Washington, DC." There is nothing a photographer likes better than variety. Documenting news, sports and features on an almost daily basis, I often hope that opportunities presented will be very different from one day to the next. 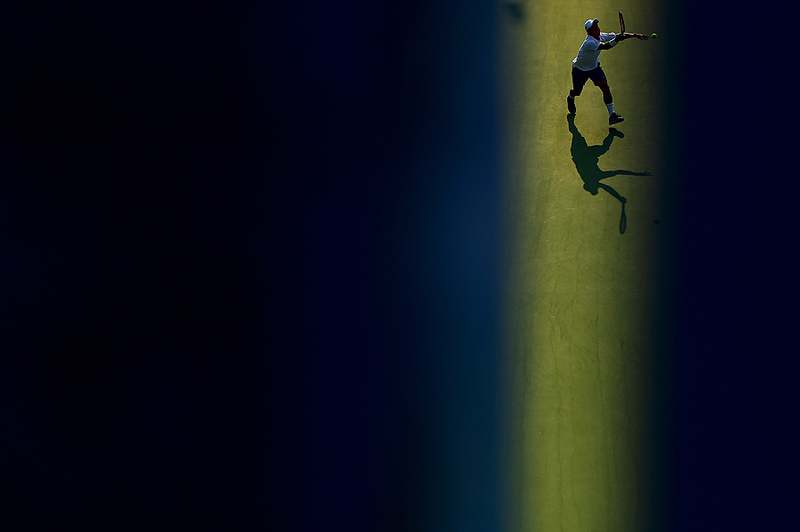 Recently, I was fortunate enough to shoot some tennis for Getty Images during the Citi Open at the William H.G. FitzGerald Tennis Center in Washington, DC. It has been quite some time since covering this sport, but it was much like riding a bike, and I quickly remembered everything from my past experiences. Needing to document multiple matches and players throughout the day and night - I did my best to not only shoot the safe images, but also break away from the pack of photographers and look for some more eye-catching photos. I waited until this spot was back-lit so I could incorporate the players shadow and then clicked the shutter when Kei Nishikori made returns. It was quite difficult to see through the spot, but in the end, I thought it was different, yet telling. 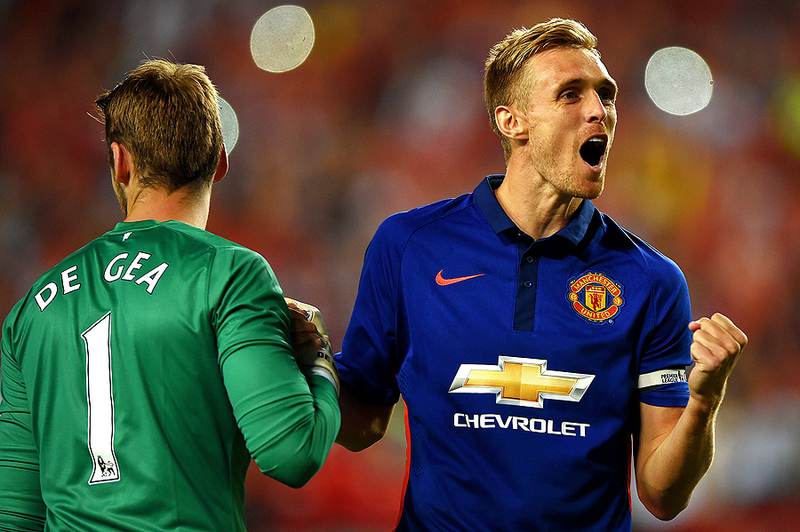 "Darren Fletcher #24 of Manchester United celebrates after scoring the game-winning goal in penalty shootouts against Inter Milan during their match in the International Champions Cup 2014 at FedExField on July 29, 2014 in Landover, Maryland." As graphic and clean as most sports photographers like to see the games we document, we must always remember that images must also be storytelling. Our objective is to communicate the story of the game and I am always looking at each and every event as a complete story with a beginning, middle and end. Sometimes the ending - or even picture that tells sums up the entire story - isn't quite clear until the the clock runs out of time. Much like Manchester United playing against Inter Milan, it was until a split second celebration after scoring the game-winning goal in penalty shootouts, that told the story. 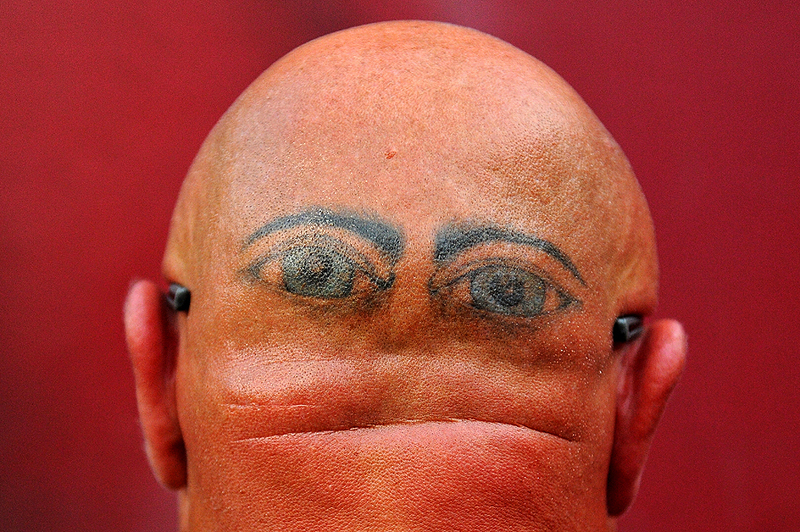 There are matches like this every day - that if one blinks - they'll miss the picture of the game.